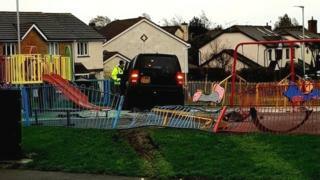 A man has been arrested after a car crashed into a children's play park in the Isle of Man. Police were called at about 12:20 GMT on Sunday after the black Land Rover drove through a metal fence and into the park, which is next to a school. The play park is next to Cronk y Berry School but belongs to Douglas Borough Council. Police confirmed a 35-year-old man had been arrested, and that nobody was injured. A police spokesman declined to detail which offences the man was held on suspicion of, adding that an investigation was at an early stage. Witnesses are urged to contact police headquarters.